St. Augustinegrass (also known as Charlestongrass in South Carolina) is often the most popular choice for lawns throughout southern United States. Especially in coastal regions where cold temperature extremes are moderated by oceanic climatic conditions. St. Augustinegrass is native to the Caribbean, Africa and Mediterranean regions, and best adapted to subtropical climates. Good for coastal regions, thrives in heat, does poorly in cool climates. Excellent to fair under drought conditions. Moderately good under heavy foot traffic. Somewhat shade tolerant. Can be used in moist, semi-fertile soils. At the moment, most common installation method is sodding or plugs; seeds are very difficult to obtain if not impossible. HIGHLIGHTS: Compared to finer textured grasses like the bermudas, St. Augustine has large flat stems and broad coarse leaves. It has an attractive blue-green color and forms a deep, fairly dense turf. It spreads by long above-ground runners or stolons. While it is aggressive, it is easily controlled around borders. It produces only a few viable seeds and is therefore commonly planted by sod, sprigs, or plugs. St. Augustinegrass is a big thatch producer, more so than other types of grass. It also requires plenty of moisture and is best suited to humid regions. Has good shade tolerance, except for Floratam. Susceptible to fungal diseases. St. Augustinegrass Decline is a virus common to Texas and Louisiana and there is no known control. WARNING: an ingredient in many weed/feed products (2,4-D) that were designed for cool-season grasses, Bermuda and Bahiagrass, can kill St. Augustine. If you intend to use a weed/feed product, make sure it is labeled for St. Augustinegrass use. According to university studies, it is best to wait at least one month before fertilizing newly placed St. Augustinegrass sod. During that first month, there is little root development or activity. This means that the turfgrass is not actively absorbing the nutrients and it is more likely that these nutrients will migrate away from the roots and there is greater risk these elements may enter the watershed. Delmar: a dwarf St. Augustine cultivar that has good shade tolerance, yet also does well in full sun. A delmar lawn has a tendency to develop heavy thatch. Palmetto: Good in coastal and island areas and is rapidly being positioned as a standard St. Augustine, having proved itself repeatedly since 1994. Prefers heat but will handle cold better than other types of St. Augustine. Performs well in both full sun and partial shade; has a natural resistance to cinch bugs. Raleigh: somewhat more cold-hardy, but does not hold up to summer heat as well as other St. Augustine's. Has been adapted to grow in heavier, clay-like soils. Sapphire: The only high performance, finer blade St. Augustine. Has a distinctive deep, blue-green color along with a soft texture. Suitable for demanding, warm climates, Sapphire tolerates salt, shade and drought, making it an excellent choice for coastal regions. Requires less fertilization and displays improved recovery from wear, with reduced weed problems. Q. Why won't my grass grow under the tree? I have the best St. Augustine type. A. The reason for the general poor performance is a lack of, or alteration of, sunlight. The light quality is diminished because trees absorb the same light needed by grass, and since the trees get to it first, they get the most. In addition, trees affect the intensity and duration of light on the turf. Trees with a dense overhead canopy also have a denser root structure that absorbs more moisture from the soil, leaving less for the grass. Trees alter conditions by moderating temperatures, leveling out the highs and lows, decreasing wind, increasing humidity and intensifying competition for water and nutrients. As a result, turf experiences reduced shoot density, more upright growth, increased plant height, decreased root depth and thinner leaves and cell walls, causing fewer carbohydrates to develop in the cell walls, reducing photosynthesis and transpiration rates and making them more susceptible to disease. In other words, grass doesn't do too well under trees. Many of the semi-dwarf types have excellent shade tolerance relative to the coarse-type St. Augustine grasses and other warm-season grasses. We also know that the semi-dwarf varieties do not possess chinch bug resistance, and those planting this grass will need to use insecticides to control infestations when they occur. Q: Reports on this new St. Augustine Grass called Palmetto are appearing in the Charleston SC area. I understand Texas has many sod producers and are also growing this grass and is doing well in Houston. Tell me about this grass. I have Raleigh currently with severe brown spots and areas that have never greened up since last winter. A: St. Augustine grasses are mainly propagated vegetatively. Therefore, breeding of new varieties takes time, which is one of a variety of reasons for their slow appearance in the marketplace. A key factor is the long and vigorous testing required before release. For example, Floratam resulted in a combined 10-plus year efforts of both the University of Florida and Texas A&M (that's why it is named Flora-T&M) has become a highly successful example of breeding efforts. Palmetto is the new kid on the block. It is available as plugs or sod. Results are encouraging. There has been anecdotal claims for deep rooting capabilities and its ability to establish itself quickly even under adverse conditions. Palmetto was discovered and developed on a sod farm near Daytona Beach, Florida. The cultivar has been tested under "real life" conditions on the sod farm and in practical homeowner situations. Palmetto is not a miracle grass, but the combination of characteristics demonstrated is unequaled. The most notable attribute when examining a field or plot of Palmetto is its deep, vivid color and soft texture. Its visual appeal alone makes it a superior choice compared to other strains available. Palmetto has proved to be exceptional both sun and shade. Often in designing a landscape, a grass is required that will thrive in both full sun and shade. This problem becomes more exaggerated as landscapes mature, and shady areas increase when trees grow larger. Palmetto is the most versatile St. Augustine available to address these changing needs. Cold snaps can severely damage or kill Raleigh St. Augustine. Palmetto has withstood temperatures near 5 degrees F. in South Carolina, Georgia, and Texas with no significant damage. In Jacksonville, Florida and Charleston, South Carolina Palmetto has remained green in areas where other St. Augustine's have gone dormant. Palmetto remained green in the Tampa Bay, Florida area after two nights of heavy frosts. Floratam and Raleigh St. Augustine both sustained significant browning out damage in the same area. Another important characteristic of Palmetto is its deep, massive root system. Once established, this could help reduce watering. In addition, this root system causes Palmetto to transplant well, and establish quickly. It is often desirable to plant a landscape that gives the appearance of a mature lawn shortly after installing. In selecting grass varieties, it's important to recognize relative strengths and weaknesses to aid in the selection of the most suitable variety for your site. St. Augustine grasses can perform well in a wide range of sites formerly thought of as sites for Centipedegrass, Zoysiagrass, or Bermudagrass. Give them every consideration. Floratam St. Augustine grass was released by the Florida and Texas Agricultural Experiment Stations in 1972 as a SAD virus and chinch bug resistant selection. It has since been observed to be brown patch tolerant. 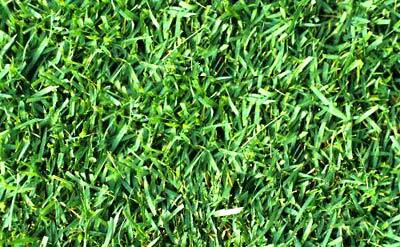 Like other Florida types, Floratam is a vigorous, coarse textured St. Augustine grass variety. Stolons of Floratam are large, purplish-red in color (demand this characteristic when purchasing sod) with internodes averaging 3 inches in length. Leaf blades are wider and longer than common St. Augustine grass. According to James Beard, TAEX Turf Researcher, tests at A&M concluded it is the most drought-tolerant of all St. Augustine grasses. Floratam is not as cold tolerant as common St. Augustine, so preconditioning by use of Winterizer fertilizer (3-1-2 or 4-1-2 ratio) in the fall (October) is CRITICAL. Floratam may suffer freeze damage. A study of the drought tolerance of grasses entitled: " Comparative Intra species and Interspecies Drought Resistance of Six Major Warm-Season Turfgrass Species" by S. I. Sifers and J. B. Beard, Texas A&M University. Their findings were: Four years of field drought resistance studies have been completed on a modified sand root zone. In the fourth year of the study, 29 Bermudagrass, 2 seashore pespalum, 2 Buffalograss, 8 St. Augustinegrass, 6 Centipedegrass, and 11 Zoysiagrass cultivars were subjected to 158 days of progressive water stress with no supplemental irrigation applied and less than 7.5 cm of natural rainfall. Degree of leaf firing was used as an indicator of dehydration avoidance and post-drought shoot recovery was used as the indicator for drought resistance. Significant drought resistance differentials were found across the cultivars and among the species. Results were consistent with the first three years of this study among the Bermudagrass, seashore pespalum, St. Augustinegrass, and Buffalograss cultivars. Among the Centipedegrass cultivars only Oklawn fully recovered. 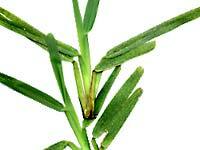 Leaf firing of all Zoysiagrass cultivars was in excess of 50%. All recovered, except Meyer at 20% and Belair at 45% after 30 days. Excellent dehydration avoidance was seen in Floratam and Floralawn St. Augustinegrass. There were large variations in drought resistance among the 5 St. Augustinegrass cultivars. Floralawn and Floratam showed high green shoot recovery. They showed less than 50% leaf firing after 34 days of drought stress and recoveries of over 90%. However, Texas Common and Raleigh St. Augustinegrass as well as Prairie Buffalograss showed over 98% leaf firing and less than 20% recovery. The performance of Floratam and Floralawn was excellent throughout the study in terms of shoot color, turgidity, and uniformity. They were comparable to 609 Buffalograss. Time will tell whether Palmetto out performs Raleigh (cold tolerance) and Floratam (shade tolerance).